The Nike Corporation has kept its hands off of these feet. Surprise, surprise. With Converse, Nike seems to have flipped its own slogan on its head. Meddle? Just don’t do it. And the strategy appears to have paid off. Converse still has its retro-rebellious buzz, and its shoes are hot. Check the feet of Avril Lavigne, Blink 182, Kid Rock and the Strokes — they’re even the go-to shoe among fashion models in Paris this year. Sales, though still a sliver of the overall market, have surged the last few years (chart). “Converse is everywhere right now,” says Marshal Cohen, who tracks fashion for NPD Group, a market-research firm: younger buyers like the hip heritage of Cons. “It’s funky and it’s lasted this long — it must be good,“ said Britney Ellis, a New Jersey teenager, after buying a pair of navy Chuck Taylors. Nike execs say they always intended to leave Converse alone. “We let the team in place run the business the way they need it to run,” says Scott Olivet, vice president of Nike Subsidiaries. 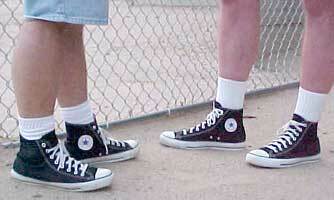 (Converse executives declined to comment.) They learned their lesson from the Bauer experience. After Nike acquired Bauer in 1995, it started selling gear with its distinctive logo, tinkered with the technology and offended traditionalists when it outfitted superstar Sergei Fedorov in snow-white skates. Nike “lost sight of the DNA” of Bauer, and “consumers recognized it immediately,” says a former top Bauer exec.